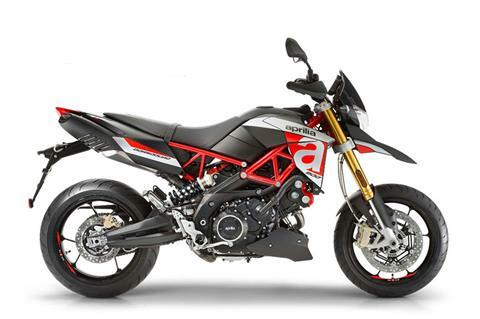 Aprilia Dorsoduro is the fun bike par excellence. Born out of an ingenious intuition by Aprilia, it was built with the sole objective of providing the most possible road riding fun, drawing from the best characteristics of sport bikes and the best characteristics of supermotards. The result is a bike with advanced technical solutions, agile and with performance at the top of its category. A truly special bike, achieved not only thanks to Aprilia's skills in packaging particularly efficient chassis architectures combined with high performance powerplants, but also thanks to collaboration with the Aprilia Racing Department, capable of earning a total of 54 world titles in the most difficult and selective competitions where they have participated, 7 of which in the world Supermoto championship. THE DESIGN - BALANCING POINT BETWEEN FORM AND FUNCTION: On the Dorsoduro 900 a new Kayaba fork makes its début (combined with forged aluminium steering yoke plates), 450 grams lighter, adjustable in hydraulic rebound damping and spring preload and better capable of withstanding the stress of sport riding and absorbing bumps on the road surface, providing control in aggressive riding and greater comfort for those more relaxed rides. 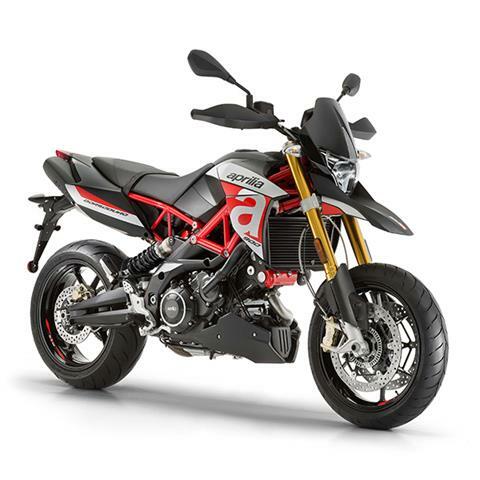 The overall improved performance of both the Dorsoduro 900 suspension systems is also due to the new pair of three-split-spoke wheels, more than 2 kg lighter than those that equipped the Dorsoduro 750. Reducing the gyroscopic effect increases handling and acceleration, as well as providing benefits for suspension performance because of the reduction of unsprung masses. The Dorsoduro 900's top shelf chassis structure is completed by a sport-derived braking system. The front end relies on radial 4-piston callipers and a pair of 320 mm steel floating discs, lightweight and capable of guaranteeing reduced braking distances and excellent modulability. The 240 mm rear disc is gripped by a single-piston calliper. Both the front and rear systems have metal braided brake lines derived from the aeronautic sector, which eliminate the annoying buffering effect of conventional lines and guarantee precision and resistance to force. ELECTRONIC MANAGEMENT: Electronic engine management is now handled by the new and more powerful Marelli 7SM ECU that dialogues with the new full Ride-by-wire electronic accelerator system, completely built into the throttle grip. This system allows even more accurate management of the fuel/air mixture and the injection throttle valve opening based on numerous parameters including engine speed, gearbox position, air flow (in quantity and speed), throttle grip and temperature, with great benefits in terms of smooth riding without opening/closing jerks, containment of harmful emissions and fuel consumption. The engine is, therefore, always able to distribute the ideal torque and provide the best acceleration, all to the advantage of a satisfying and fun ride. 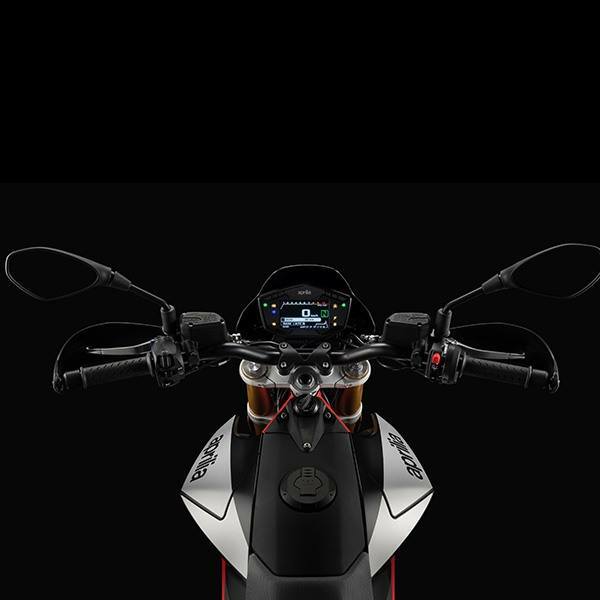 The system also allows a weight reduction of 550 grams compared to the previous Ride-by-wire that equipped the Dorsoduro 750. The sophisticated electronic management also provides the possibility of changing the engine mapping, radically changing the character of how the power it is capable of developing is unloaded onto the ground. The Sport setting provides an immediate and aggressive throttle response; the Touring logic provides a smoother response, ideal for touring and daily use, whereas the Rain map is ideal in the event of difficult weather conditions or on slippery road surfaces. Dorsoduro 900 introduces a new Aprilia traction control system with sensitivity adjustable to three levels (it can also be disabled) to limit rear wheel spin by acting on ignition and the injection throttle valves. The Dorsoduro 900's Aprilia Traction Control system is combined with a Continental two-channel ABS system with developed calibration in order not to take anything away from the sporty ride. The new electrical system places the engine control and management systems in communication with the new color TFT digital instrumentation. The compact unit with a 4.3-inch screen contains a wealth of information that is always highly legible thanks to its capacity of adapting the background and font colors based on the conditions detected by the light sensor. One of the optional features is the AMP installation kit, the Aprilia multimedia platform that connects a smartphone to the vehicle to provide an exceptional quantity of information useful for the ride: the new instrumentation lets you view all the data related to incoming/current calls on the screen, as well as information related to the use of an intercom or any audio files that you may be playing. BETTER PERFORMANCE: Starting from the 750 cc 90° V-twin engine base, well-known and popular because of its character and reliability, Aprilia developed a new 900 cc unit with the goal of obtaining more torque and response at low and medium rpms for a thrilling riding experience. 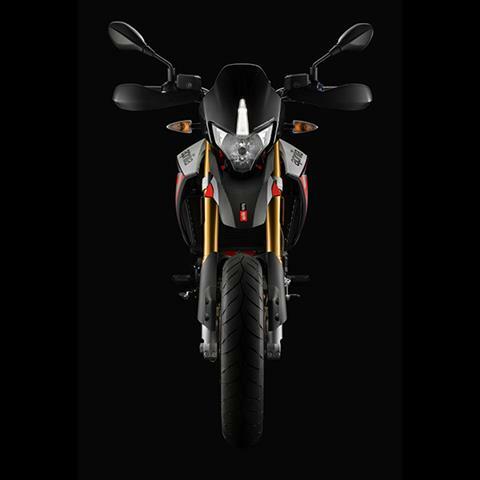 The Aprilia V-twin was therefore revisited in numerous details to achieve this purpose. The new engine capacity was obtained by increasing the stroke from 56.4 mm to 67.4 mm and leaving the bore unchanged (92 mm). 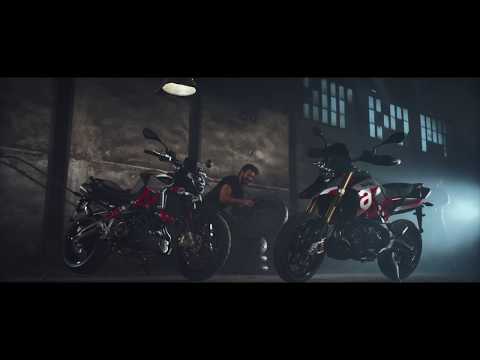 By so doing, maximum power now peaks at 95.2 HP at 8,750 rpm, but more important is the maximum torque value that goes from 8.4 kgm (82 Nm) at 4,500 rpm on the 750 cc V-twin to 9.17 kgm (90 Nm) at 6,500 rpm on the new 900 cc V-twin, a value that is truly at the top of its category. It should be noted that, despite the fact that maximum torque peak for the new 900 cc V-twin is reached a higher rpms, the torque curve is actually flatter and always higher than the 750 cc predecessor. This change allowed the acceleration response to be increased, all to the advantage of a fun ride, without limiting in any way whatsoever the proverbial reliability of the powerplant, that in any case, now benefits from a new internal lubrication circuit capable of limiting power loss due to churning and lubrication consumption. The exhaust system, fitted with a double oxygen sensor, contributes to bringing the engine to within the limits established by the Euro 4 pollution standard. Aprilia Dorsoduro 900 is also available in a limited-power 35 kW version, ideal for newly licensed riders. 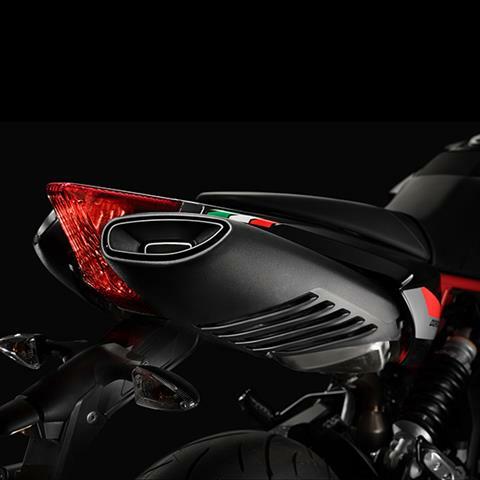 CHASSIS ARCHITECTURE: All Aprilia bikes have always been considered a point of reference for their excellent chassis architecture. The Dorsoduro 900 chassis provides high characteristics of efficiency, balance, a tight ride and precision even in extreme track riding, but at the same time it is easy and intuitive for daily use. These qualities are the merit of the particular layout of its various elements. 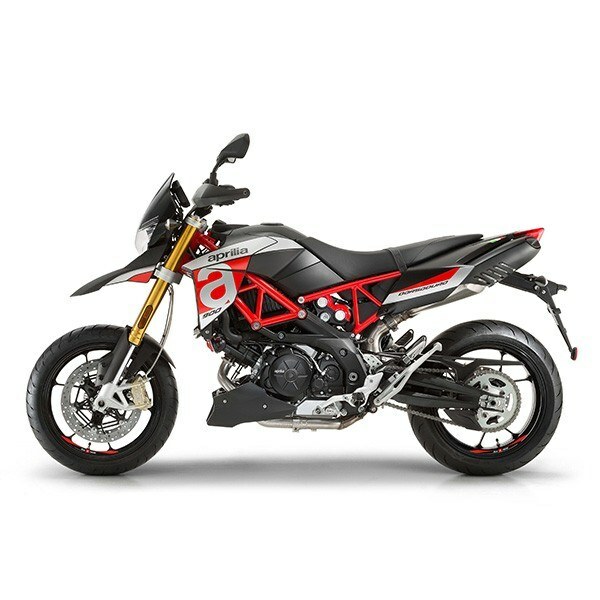 The frame takes advantage of the know-how Aprilia has developed in racing competitions, drawing deeply from the experience gained on the mixed structures used in the Supermoto world championship. The trellis upper part in steel tubing (now painted red, like the saddle support frame) is combined with wide spread aluminium lateral plates using special, high-resistance bolts. The result is an extremely rigid and lightweight structure, the best solution for taking full advantage of the revamped capacity of the 900 cc V-twin, with an aesthetic impact that communicates light weight, extremely high technical content and Italian style. Another strongly distinctive technical feature is the lateral and inclined positioning of the shock absorber, a unit that is adjustable in spring preload and hydraulic rebound. This solution has created precious space for an optimum exhaust manifold layout, without having an impact on the length of the bike and without stressing the shock absorber thermally. The aluminium swingarm is sized to withstand the asymmetrical stress due to the lateral positioning of the shock absorber and it boasts the torsional stiffness and elasticity characteristics indispensable for precision at rest and the ride feeling in transitory stages. On the Dorsoduro 900 a new Kayaba fork makes its début (combined with forged aluminium steering yoke plates), 450 grams lighter, adjustable in hydraulic rebound damping and spring preload and better capable of withstanding the stress of sport riding and absorbing bumps on the road surface, providing control in aggressive riding and greater comfort for those more relaxed rides. 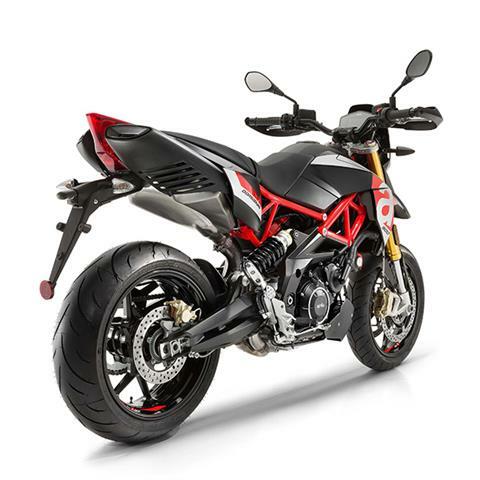 The overall improved performance of both the Dorsoduro 900 suspension systems is also due to the new pair of three-split-spoke wheels, more than 2 kg lighter than those that equipped the Dorsoduro 750. Reducing the gyroscopic effect increases handling and acceleration, as well as providing benefits for suspension performance because of the reduction of unsprung masses. The Dorsoduro 900's top shelf chassis structure is completed by a sport-derived braking system. The front end relies on radial 4-piston callipers and a pair of 320 mm steel floating discs, lightweight and capable of guaranteeing reduced braking distances and excellent modulability. The 240 mm rear disc is gripped by a single-piston calliper. Both the front and rear systems have metal braided brake lines derived from the aeronautic sector, which eliminate the annoying buffering effect of conventional lines and guarantee precision and resistance to force.